Whenever someone buys something, he or she is making a decision. The decision is to spend money in exchange for a product. Following this same logic, it is the job of salespeople to guide and influence this decision process. It stands to reason that if you are trying to influence someone’s decision-making process, you want to start that effort as early as possible. It is progressively harder to change the decision the later that you start. Eventually, it becomes impossible to reverse the decision. For instance, if you try to influence the decision one year after the decision is made, you have no chance of success. Your only opportunity that far out is to convince the customer to make a new choice and effectively throw that old decision out. For argument’s sake let’s say that you have 0% of changing the decision. As we move the timeline earlier, it is probably just as hard to influence the process one month after the decision. You may have more time to achieve this since it might be possible to “return” the purchased product, but even in that case, the original decision is tough to change. As above, let’s assume that this is a 1% chance of happening, but anything past that one month mark is effectively 0%. Your influence of a prospect’s decision is probably the same throughout the entire month after the decision has been made. Let’s face it you are late. On the other end of the decision process, before the customer has ever thought about purchasing a product in your space, you probably have the most significant ability to influence the decision (assuming that you have access to the decision maker). Before the decision maker has ever thought of the problem that your product solves, you have the highest ability to influence that decision to be favorable to your product. After all, at that point, your decision maker hasn’t talked to any competitors and hasn’t researched the industry on the Internet. In fact, by this definition, the customer doesn’t even know of the problem! So in the world of sales professionals where we influence the decision (which is our job) our ability ranges from 100% to 0%, depending on the buying timeframe of our prospect. As we can easily see, as soon as the prospect starts to research the space, our influence begins to dwindle. So it just makes sense that if you want to win more orders (and eliminate your competition), then you need to talking to prospects extremely early in the decision-making process. 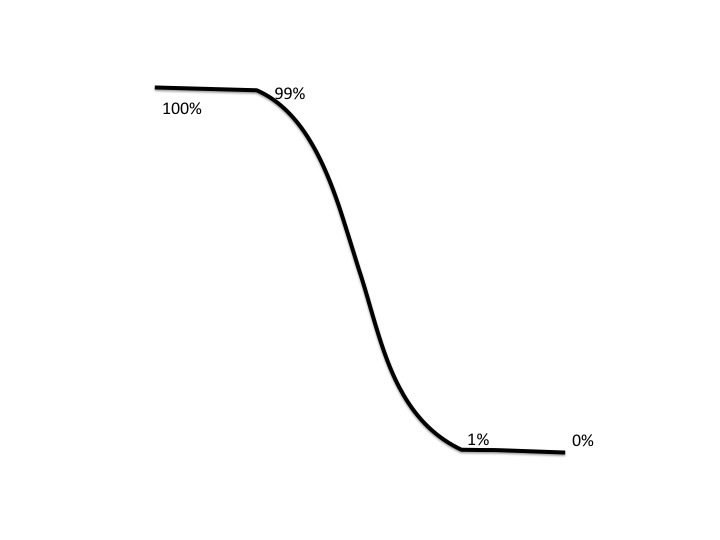 The drop-off from a great deal of influence to almost no influence is not a straight line. At the beginning of the process the drop off is slow and then partially through the decision-making process competitors are eliminated, and the choices start to dwindle down. Finally, at the end of the decision-making process, the decision is pretty much made, but the last few steps of the process are to get everyone on board with the decision and perhaps to negotiate the final price. We need to communicate to prospects early in the decision cycle, but we need to do it effectively and efficiently as we will never be able to predict when the early prospect becomes serious about the benefits that our products provide. The big challenge is that you need to communicate with your early prospects without spending an inordinate amount of time with them because most of them are not ready to buy, but they are receptive to influence. Your challenge is to communicate with them effectively. Luckily, this is a lot easier in the 21st century that it has ever been. We now have exceptional tools to convey information to prospects quickly, efficiently, and cheaply. These tools are email and social media. I spend several pages in my book, Eliminate Your Competition, describing how a complex business organization makes a decision. The reason to understand this process is for you, the salesperson, to know where you are in the process and realize that your ability to influence the decision is waning. You lost. The customer decided to use a competitor’s product. You will not be getting that commission check. I will not insult you by saying that it is just business and wasn’t personal. It is affecting you in a very particular way. You may feel inadequate or anger. You may also be in disbelief. You may be frustrated and disenfranchised. You may also have some fear and doubt. There may be some loss of income or anticipated income due to this loss, and now you will have to tell your significant other that the check won’t be as big. Worse than all of those feelings, you may feel shame within your peer group and your company. These are all common feelings, and you shouldn’t kid yourself into believing that they aren’t there. Instead, you should deal with these feelings head on and accept them. Plenty of ‘feel good’ books out there will lift your spirits, and my book is not one of them, and this site is not for crying. There is no crying in sales. The best advice I have is to get right back out there and keep selling. You need to internalize these feelings and make them motivate you to accomplish more and be more successful. You have just felt emotions that you don’t like and don’t want to feel again. Use this as motivation to avoid these bad feelings again or to have the desire to inflict these emotions on your competitors. Ask yourself these questions (if you haven’t read my book Eliminate Your Competition then these may not make sense – maybe that is why you lost). Did you fill in every box of the Power Matrix? Were all those people unique? Did you set up a Relationship Map that mapped all of your resources to the appropriate person at the prospect? Did you set up Personal Vision Goals for every person in the Power Matrix? Were you late to the deal and you acted like a Hunter rather than a Trapper? Did you lay out the evaluation plan for the prospect? Did you lay traps for all of your competitors? Should you have focused on the winning competitor differently? Was it an A competitor that has similar capabilities or was it a B or C competitor that took the evaluation into your weaknesses. Did you effectively sell your product, your company, and yourself? If you don’t understand these questions, then you need to spend time with my book Eliminate Your Competition. It is designed to help you win more frequently and maximize your commission. You may purchase my book Eliminate Your Competition from your favorite book retailer. The ebook version is available at the most popular retailers such as Apple, Amazon, Barnes & Noble. The paperback version is also widely available at such retailers as Amazon, Barnes & Noble, and Books A Million. Did they not understand the prey? Why didn’t the trap work? Did they not place the trap in the correct location? Did they use the wrong type of bait? The big issue here is that you do not lie to yourself. You can lie to your boss. You can lie to your spouse. You can lie to everyone else, but do not lie to yourself. Did you really do everything you could to win that deal? Answer the above questions. Learn from your loss. Now get back up on that horse and make it happen. I recently encouraged you to send handwritten thank you notes to your prospects and customers. What do you do if you have lousy handwriting? First of all, don’t be so hard on yourself. Your lousy handwriting is part of the reason that the note is so important. However, there is a solution for those of us that have lousy handwriting that is so bad that we cannot read what we wrote. If you still want to send a personalized note: use Bond. Download the basic version of the Bond app, and you can type out a message, pick a card and handwriting style ranging from the messy cursive of “Gramercy” to the clean all-caps “Hudson” and upload your signature and address. Then everything else, from postage, envelope stuffing, sealing, and drop-off, is taken care of by Bond. You don’t see the note or deal with the hassle of mailing it. You get an email when it ships. Bond offers about 20 different handwritten house styles. After the note and address are composed, and the type style is chosen, robotic pen-writers (who never worry about hand cramps) write the notes on selected paper and envelopes. The notes can be reviewed online before being snail-mailed. You can also utilize your own handwriting style via an intake form that requests you write various sentences and characters. All alphabet letters are covered, and Bond’s software generates a couple of dozen variations for each written letter. When the note is written, the software employs the variations of each alphabet letter to compose a unique version of the chosen handwriting style for each note. I have no financial interest in Bond, I am just a happy user. When I signed up a long time ago, they allowed me to send a sample note to myself so that I could see the process and the final product. From that point on, I use Bond whenever I post a thank you note to a customer. This is a follow-on guest article by L. T. Dravis from the previous article 7 Secrets Of A Winning Sales Coach. If you haven’t read this previous article then it makes sense to jump over and do the pre-reading. Take time to discover just how good you can be by taking time to understand how good you already are! Respond to the following scenarios using five basic scales. A quick way to score this test is to simply use a highlighter to hit the number that most closely matches your response. My goals are realistic, clear, compelling and support our company’s complete sales success in our territory. I discuss Sales Goals with Senior Management and with every Sales Player, individually and collectively, on my team. I supply lists of Sales Goals to Senior Management and Sales Players on a regular basis for their review, discussion, and final approval. I communicate often, easily, and quickly. I double-check to make certain each person I speak with understands my position and I also double-check to make certain that I understand the other person’s position. I place a greater emphasis on listening than I do on speaking. I enjoy my work. I make a solid contribution to the bottom line with my Sales Coaching skills. I take good care of myself, physically and mentally, so I remain capable of performing at the top of my game. I work to maintain a sense of balance between my position as Sales Coach and the responsibilities of my superiors and colleagues. I consistently challenge myself to improve my performance as a Sales Coach, as a colleague, and as an employee. I constantly search for newer, better ways to expand my skills and the skills of my Sales Players. I am willing to delegate wherever necessary and I freely share coaching responsibilities with Assistant Coaches and role models. I stay in close, daily touch with each Sales Player to coach, motivate and help in any way I can to increase sales and profits. I am quick to praise Sales Player successes and I never publicly criticize anyone in the organization. TOTAL POINTS – 125-115: EXCELLENT. You are doing a great job. Your goal setting skills, communication skills, job satisfaction and performance, professional relationships, and team building skills are well thought-out, realistic, and viable. Pat yourself on the back and keep up the good work. TOTAL POINTS – 110-95: GOOD. You are performing well. Your scores tell you which areas need improvement. Prioritize objectively; select the single most critical area to work on first and take immediate positive steps to develop the skills you need. Put your ego aside and ask your Assistant Coach(s) and Sales Players for suggestions. TOTAL POINTS – 90-80: FAIR. Review your responses. Pay special attention to high scores and low scores. On reflection, do your responses accurately portray you as Sales Coach? Would you change any response? If you wouldn’t change any response, change your behavior relative to the lowest scored scenario. A tip: The most critical scenario is number 1, Goal Setting Skills. If you didn’t score well on number 1, jump on the problem and get all the help you can . . . immediately. TOTAL POINTS – 75 or LESS: TIME FOR A CHANGE? If you are not suffering some sort of temporary setback (domestic problem, health problem, personality clash at home or on the job, short-term financial crisis, etc. ), stop what you are doing and discuss your situation with someone you trust. If you’re unable to immediately change your responses to these scenarios, you should seriously consider stepping aside in favor of someone else in the organization who is better equipped to perform as a Sales Coach. Copyright © 2008 by l.t. Dravis. All rights reserved. If you have questions, comments, or concerns, Email me at LTDAssociates@msn.com (goes right to my desk) and since I personally answer every Email, I look forward to hearing from you soon. I recently heard a fascinating story from a Sales Coach who told me how he succeeded in overcoming some significant challenges when he was recruited as a rookie sales manager for a major-brand forklift dealership in the late 1990s. Despite the brand name and the brand’s reputation for quality and excellent resale value, the dealer’s sales record for new, reconditioned, and used forklifts was abominable and had been lousy for quite some time. At this Sales Manager’s request, I’ve agreed to keep him anonymous, so for our purposes, I’ll just refer to him as George. George had been the number one salesman for a southern California forklift company selling more units in his territory in a month than most of his competitors sold in a quarter. George was relatively well known throughout the industry, so a failing dealership in the northwest desperately needed to sell or die, so management went after George like the hare chasing the tortoise. Well, this was nothing new for George. He’d been recruited for years by dozens of other dealers all over the country. But the dealership in the NorthWest was something else. Sales had been slipping for several years, market share had plummeted to historic lows, and the service and parts departments were experiencing a severe revenue shortfall due to the cumulative, drop-off in overall new, reconditioned, and used forklift sales. So, the dealer principal called George and literally begged him to meet for dinner so he could offer him tons of money and complete freedom to run the sales department anyway he saw fit. George is anything but dense. So he looked at this opportunity for what it could be, not for what it seemed to be. The new job would undoubtedly be a tough challenge with lots of inherent risk of failure. On the other hand, it could be a once-in-a-lifetime opportunity. When he looked at the new job’s potential, George realized he had nothing to lose. Not really. After all, if he could turn this company around, he’d be able to write his own ticket with anyone, anywhere. On the other hand, even if he failed, he could always hit the road and earn six figures selling forklifts for any dealer, anywhere. So, he looked the dealer principal in the eye, shook his hand, and accepted the position. George inherited nine salespeople with his new job. The only producer in the entire sales department was a mid-forties salesperson we will call Jasmine (not her real name). Now, Jasmine had only been in the industry for about five years, yet she was selling forklifts like there was no tomorrow. None of the other eight salespeople seemed to have the experience, training, motivation, or the character necessary to focus on much of anything beyond a draw, driving a company car, and taking paid holidays. Morale had dropped as low as sales, profits, and the infrequent commissions check. Within 3 months of George’s arrival in the sunshine, all those excuses faded like memories of last year’s Grammies, and the sales department was selling new, reconditioned, and used forklifts like never before. What did George do to change things around so dramatically? For the first few weeks, after he became Sales Manager, George did nothing at all. He didn’t make any changes; in fact, he didn’t even make any suggestions. The sales crew was delighted because they began to believe that George would never be as good a sales manager as he had been a territory salesman. There were two reasons for this unlikely attitude. First and foremost, the sales crew didn’t want things to change, not really, because they didn’t believe changes would do anything but make them work harder for less. Secondly, they’d heard all about George’s heavy-hitter reputation and thought it made them look bad, so they secretly rooted for George to finally fall flat on his behind. Given the severity of the sales situation, the big question floating around the company was why isn’t George doing anything? Is he just lazy? Is this the Peter Principle in action? Is George not up to the job? Or, is he too much of a wimp, too scared to tackle this huge, long-term problem head-on? George did nothing because he was too smart to move too quickly, too soon. He knew that before he could institute changes to increase sales and profits, he first needed to invest some serious time and patience learning to understand the dynamics that had killed sales for so long at this particular dealership. This time and patience thing took more than a little courage on George’s part. It was tough for a results-oriented guy like George to overlook caustic comments from Senior Management and pass off the disappointed stares flashed his way by the few people in the sales department who really did want change. Nevertheless, he stayed focused on gathering information, analyzing sales records and call reports, talking with salespeople, managers, department heads, and customers, digging for the root causes of the only problem that really mattered: Not Enough Sales! After George analyzed management support, financial resources, company image in the territory, facilities, equipment, customer service, parts and service support, product quality, and the company’s relationship to its factories, he concluded that he was right about the root cause: The sales team was utterly incapable of doing its job. Sure, like any warm body, each sales person was capable of taking an order for a forklift, but nine of nine salespeople weren’t trained in the skills they needed to sell significant numbers of forklifts. Eight of the nine obviously lacked confidence and direction and had never experienced any consistent success … so they had no positive history to fall back on. Nine of nine salespeople worked – when they worked – only for themselves because not one of them had a clue about the collective importance of working together as a team. Last but not least, since Jasmine had always been off doing her own thing, completely disassociated with the rest of the group, her colleagues had no role model to emulate. George made it his business to continue to get to know each salesperson, both as an employee and as a person. Each afternoon, he would invite one of the nine to come to his office early the next morning for 15 minutes or so before the switchboard opened, just to talk. He provided fresh coffee, hot chocolate, and a variety of pastries to please any taste. Discussions were friendly, casual with lots of give-and-take. Over time, each individual came to learn that George wasn’t a threat and, at the same time, they began to believe in George as a leader and as a coach who could and would help them sell more and earn more, more often. If you’ve heard the term “Stepping Up” then you probably heard it in the NBA or NFL. “Stepping Up” means that a top performing player assumes a leadership role on the team. Because Jasmine was the only real performer in the sales department, George decided to help her step up. He trained her thoroughly on the ins and outs of the Sales Coaching concept to help her realize that despite years of separation, the team really needed her to become a Success Role Model. George knew very well that the best way to transform eight below average producers was to get them to emulate the one strong performer. George also realized that if Jasmine’s sales began to drop – for any reason – she would lose credibility with the rest of the team. So, he worked to coach her, subtly and quietly, because he didn’t want to offend her sensibilities as a top performer. He worked with her consistently because he wanted to keep her numbers strong. In George’s second month as Sales Coach, Jasmine was able to generate nearly 200% of budgeted new, reconditioned, and used sales in her territory. And, senior management and others around the company began to drop their doubts about George’s abilities. At this point, we asked George why he didn’t merely set himself up as the team’s role model. After all, his sales history was nothing to sneeze at! “I felt that my example wouldn’t be as meaningful as the example Jasmine could set,” he said with a smile. “After all, even though these salespeople weren’t particularly friendly with each other, they knew Jasmine well enough to respect her abilities as a top-notch sales person and would, therefore, be more likely to emulate her strategies and tactics. “We started slowly at first. In Sales Practices and Team Meetings, I’d ask Jasmine to talk about her week was going. She’d tell us who she sold to and why. It was just a casual conversation. No lectures, no pressure. After a couple of weeks, I began to encourage the others to interact with Jasmine, to ask questions, to talk about their successes and failures. And, in no time at all, we had our Success Role Model working to help the team sell more, more often, with no resentments and no resistance. George refused to waste time with mealy-mouthed platitudes. Because he felt obligated to turn the company around as quickly as possible, because forklift salespeople work in an incredibly competitive business, George refused to take anything for granted. He believed that he owed it to Senior Management, to himself, and especially to Sales Players, to come clean and communicate his expectations to everyone concerned. Activity Goals, Behavior Goals, and Results Goals. An ACTIVITY GOAL, for example, requires each Sales Player to send out a minimum of 25 mailers per week with telephone follow up calls within seven days of each mailing. A BEHAVIOR GOAL requires each Sales Player to provide a quote to the customer within 24 hours of the initial contact. The RESULTS GOAL that got the most attention requires each Sales Player with at least one year in a territory to sell a minimum of $100,000.00 in sales of new, reconditioned, and used forklifts each and every month. No matter how productive you are as a Sales Coach, George says, no matter how hard you and the company work to support the sales department, there will always be someone who won’t step up to the plate. George doesn’t hesitate to confront poor performers because he refuses to tie the team’s performance to the lowest common denominator. He focuses on the only thing that really matters: Consistent, profitable sales! If a salesperson can’t or won’t generate enough in profits to exceed the company’s cost in payroll, commissions, benefits, etc., George recruits a replacement and immediately cuts the player from the team. If a Sales Player is a marginal performer but is willing to admit the shortcomings that need to be fixed, George, Sales Coach, works to bring that person to the point of making the final decision. This means they either ‘decide’ to join the team, immerse themselves in the Sales Coaching process, and start selling or they ‘decide’ to leave the company… immediately. George told us that that the only thing worse than someone who resigns and leaves is someone who resigns and stays… so he never allows anyone to stay if they are already checked out. Author’s comment: Sensible approach… no wonder this guy’s a winner. Look, George says, after the dust settles, we are all just people. We are fallible human beings who make more mistakes than we care to admit. So, George makes it his business to firstly admit his own mistakes, no matter how tough it may be to do so. Because he agrees with Dr. Phil when he says you can’t change what you won’t admit, George expects Sales Players to accept responsibility for their own shortcomings. Irrespective of performance failures and character flaws, George continually reminds the team of his expectation that everyone – Sales Players, senior management, department heads, key personnel and, of course, the coach – will treat everyone else with complete dignity and respect. George promotes this aspect of his Sales Coaching effort by taking the entire sales team out of the office once a month – every month – for a fun dignity and respect building group activity – go-karting, golfing, dinner, lunch, breakfast, something. George believes that his job as Sales Coach is just as critical as an NFL coach. Like any winning NFL coach, George recognizes that he has to stay close to the action. To be a capable, credible coach, he has to be visible to Sales Players, customers, prospects, senior management, department heads, and key personnel in the company. So, like any good coach, George spends a great deal of time each week talking to people, on the phone, in meetings in his office, traveling with Sales Players, in front of prospects and customers, asking questions, and observing how sales plays are won and lost. As a result, George has gained incredibly accurate and timely insights into his performance, into the performance of the Sales Team, and into the real needs of customers and prospects. These insights, of course, have helped George set realistic team goals, reward winning Sales Players, supply real customer needs, and thereby triple sales within 12 months. You can do the same and more… if you really want to. This team thing is nothing new. We all play our lives out on a variety of teams … the team at home with our families, the on the job team with colleagues, the team we play on with good friends and close neighbors and on and on. Some of us stand on the sidelines, watching and cheering… we are called receptionists, sales coordinators, service, and parts folks, truck drivers, and senior managers. Some of us take the field and compete… we are called Sales Players. And a crazy few of us do it all: we watch, we cheer, we train, we cajole, we motivate, we even play… we are called Sales Coaches! Identify precise goals… be clear and very vocal about what you want to achieve and when you want to complete it, and colleagues & friends will hold you to your goals! When you clearly communicate your goals to individual Sales Players, they will begin to adopt your goals as their own. And, when your Sales Players understand the value and significance of your goals, they will play harder to help you achieve them. And that’s how you play the sales game to win.